Heading to Expo 2010 in Shanghai this summer or fall? Let me tell you about a great day trip. 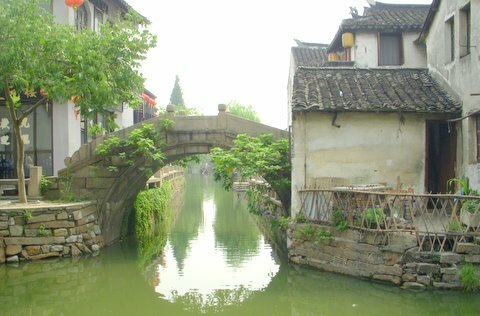 We didn’t intend to visit the “water town” of Zhujiajiao when in the area in this past summer; instead, we’d planned on a side trip to Suzhou, famous for its silk and embroidery. But that would have meant cutting short our visits to other attractions, so we boarded tourist bus no. 4 at Shanghai Stadium for the one-hour ride to a 1,700-year old Chinese mini-Venice, a magnificent maze of canals and historic buildings. The drive through rice paddies, waterways and canals to Lake Daishon is a balm to sore eyes blanched by the hustle-bustle of Beijing and Shanghai. The bus dropped us at Zhujiajiao’s new bus station just north of the historic district, with five hours to explore the town before the heading back. Map in hand, we followed the directions and our instincts, crossing bridges to what appeared to be a city under construction. This was the new section of Zhujiajiao, developed in the old style in time for the World Expo, which runs May 1 through October. 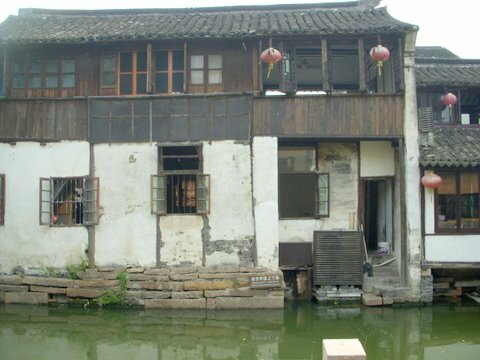 Zhujiajiao, located beside several converging rivers, was a hub of rice and textile traders. The merchants extended the rivers to their warehouses criss-crossing the city with canals. We walked the streets and alleys showcasing whitewashed, tile-roofed two-story buildings, some dating back to the Ming Dynasty (1368-1644) . But one building north of old town center towers above all the others: the five-story edifice topped by a pavilion in Ke Zhi Yuan garden on Xijie Street. The Garden, designed in 1912 with both European and Chinese influences, is a national landmark. We gave the Garden a miss preferring the tradiotional town accessible via bridges. Zhujiajiao has 36 of these ancient stone bridges, some with marble or wood elements. All 36 are still in use, but the most famous is the Fangsheng over the Cao Gang River, at the northeast edge of town. Erected in 1571, it stretches 230 feet (70 meters) and, unlike any other bridge in the Shanghai area, rests on five arches. Its Dragon Gate Stone depicts eight dragons encircling a shining pearl, a reminder — as if you needed one — that you’re not exactly in Venice. Our tour bus ticket served as an entrance ticket to the Old city, so we walked into the maze of stone paths, bridges, wooden boats tied to the shores, and fishing poles hanging from drooping arms, with children and pets playing in dirt and the occasional cyclist trying to weave through narrow passageways and children and pets. 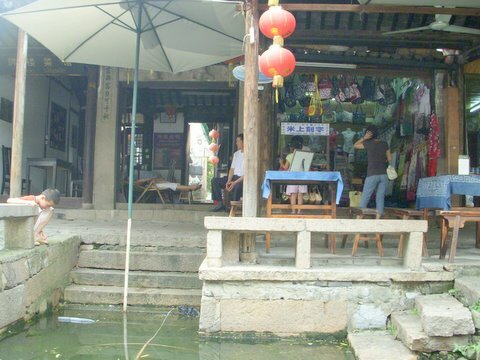 This was the Zhujiajiao we were looking for, the traditional town of the Song and Yuan dynasties (960-1368 A.D.). 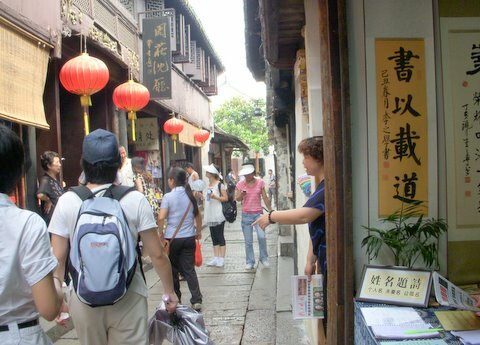 The ups and downs of dynastic rule had long turned this town into a backwaters and it was in 2000 that Zhujiajiao was included in Shanghai’s “One City Nine Towns” promotional campaign. 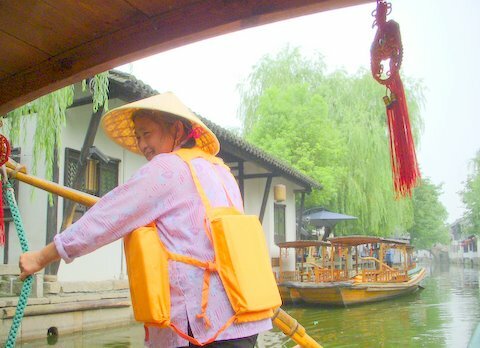 Since Zhujiajiao has more canals than roads, boats are a major means of transport. We took a tourist boat ride, and our “gondolier,” a cheery, middle-aged woman, skillfully glided us through waterways and under bridges through the old and new sections. The newer side, a replica of the old was still deserted and seeing our uninterested visages, the gondolier broke into a song. The lilting melody intermingled with the willows and the deserted canals was a diversion and so was the boy making a show of catching a fish. Wonder if he really did. At another point we saw a man contemplatively washing turtles. Pets or dinner? Back on land after our 80-minute ride, we walked along National Street and its arterial stone slab alleys with tea shops, eateries, and curio shops selling handicrafts, embroideries, calligraphy, and other items. A shoemaker almost turned violent when he caught us trying to photograph him, but otherwise, we were swept up in a cornucopia of art and antiques. 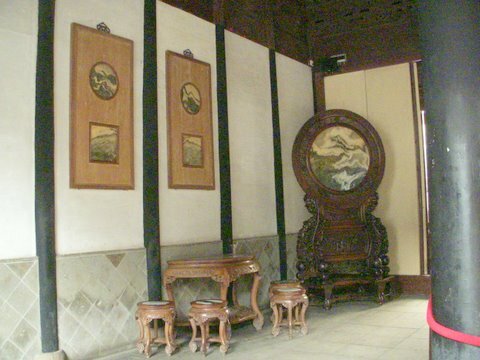 At one point we followed a tour group into a nobleman’s house, a maze of courtyards and rooms with wooden furniture and artifacts. Other attractions include the Memorial Hall of Wang Chang, one of the Seven Scholars of the Qing Dynasty, the No. 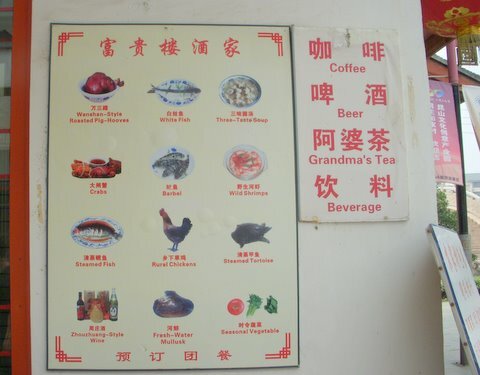 1 Tea House, and the Qing Dynasty post office, which displays evocative old postcards. There are also places where ancient culture intermingled with modernity. For example, the Books Tearoom, at 35 Caohe Street, offers traditional tea, 21st-century organic dishes, and thousands of books and DVDs. Zher, at 118 Xijing Street, may be a Chinese beer parlor, but it’s run by a punk rocker, and that’s reflected in the decor and the sound system. FYI, Zher’s owner is not the only bohemian type to have settled hereabouts; a few refugees from Shanghai’s rat race have moved here, creating an appealing mix of old-fashioned and avant-garde residents. In addition to old-new hybrids like the Books Tea room, Zhujiajiao has plenty of traditional eateries where you can enjoy rose-flavored fermented bean curd, dark-rice zongzi dumpling, or roasted soybeans. There are several guesthouses in town, too, such as 1, 2, 3 (yes, that’s its name) and Cao Tang, but we didn’t have time to overnight on this trip. Next time, for sure — but for now, our five hours were up, so we boarded bus No. 4 and headed back to Shanghai. I’m trying to fake knowledge of China. Your blog is really helping. Thanks.